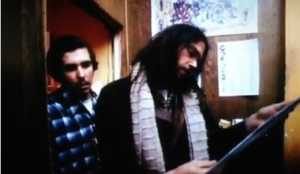 A 1971 video of Neil Young confiscating a CSNY bootleg album from a record store was making the rounds on social media this weekend. The rare footage shows Young meandering through a record store, discovering bootlegged albums, including a Dylan album, and leaving the store with the CSNY album, saying he should not have to pay for it. The record store clerk is confused, doesn’t recognize Young, and they end up calling a higher-up on the telephone. Young leaves the store with the album.